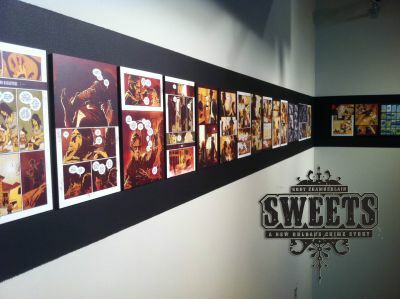 Berkeley, CA â€“ 2 September, 2011 â€“ SWEETS: A NEW ORLEANS CRIME STORY, the acclaimed noir-inspired comic book miniseries written and drawn by Louisiana native Kody Chamberlain, will soon be collected into a complete trade paperback through Image Comics. 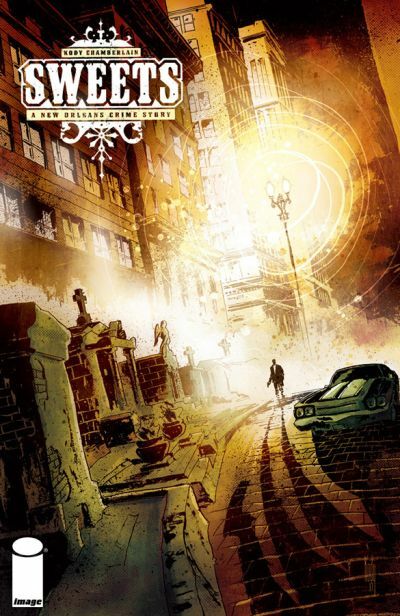 Chamberlain’s gritty and richly illustrated series tells the story of a down-and-out detective trying to bring a killer to justice before his city and evidence are washed away by an impending storm. SWEETS is steeped in effortless local detail, recalling readers to the sights, sounds, and flavors of New Orleans. While Chamberlain’s fans await the release of the new trade paperback collection, his work is being presented for the first time ever in a fine arts gallery setting at The Arcadiana Center for the Arts. The gallery exhibition is now open and available for viewing until October 1st, 2011. Arcadiana Center for the Arts will also host a release party and book signing for the trade paperback comic with Chamberlain on September 10th at 6pm. “I enjoy the rare one man comic book trifecta that actually works out. 4/5 stars!”—The Daily BLAM! SWEETS: A NEW ORLEANS CRIME STORY TP (JUN110516, ISBN: 978-1-60706-413-8), a 136-page full color crime noir comic book, will be on sale for $14.99 in stores September 9. For more information about the work of Kody Chamberlain, visit http://www.kodychamberlain.blogspot.com/.